Working with personnel from Fisheries and Oceans Canada, the team assessed the animal and determined it needed to be admitted to the Rescue Centre for treatment. On Tuesday, the team travelled to Vancouver Island and was able to secure and transport the young male back to the Rescue Centre in Vancouver. The animal is estimated at three to four years old based on the smaller size of his sagittal crest, the bony protrusion on his head. A thorough exam by the veterinary team on Thursday determined the animal is dehydrated and emaciated; and weighs only about 100 kilograms. Bloodwork, urinalysis, x-rays and ultrasounds showed some abnormalities in his blood consistent with renal changes, as well as some degree of pneumonia in his lungs and an old fracture to his left hind flipper. Meanwhile, Rescue Centre staff have named the sea lion Campbell. California sea lions (Zalophus californianus) breed off the coast of Southern California and the Baja peninsula. During the non-breeding season, large numbers of animals, mostly male, migrate north to B.C. Despite being hunted for thousands of years until they were protected in the 1970s, the current population of California sea lions is considered healthy. 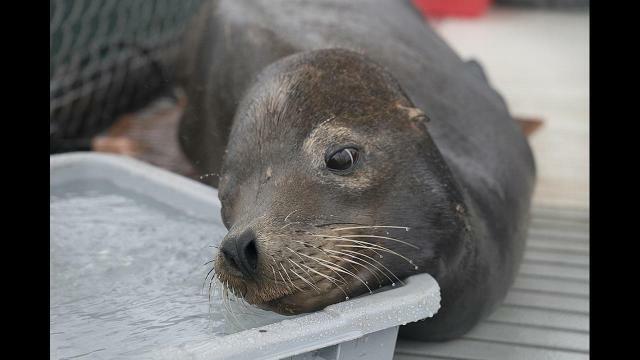 The Vancouver Aquarium Marine Mammal Rescue Program assists distressed marine mammals from the British Columbia coastline. Patients range from elephant and harbour seals, sea otters, sea lions, sea turtles, harbour porpoises, false killer whales, dolphins and other cetaceans including killer whales. In the past 12 months, more than 200 marine mammals have been admitted to the Rescue Centre for treatment. This is the third sea lion to be admitted to the Rescue Centre in 2017. Vancouver Aquarium Marine Mammal Rescue Centre, a not-for-profit Ocean Wise initiative, presented by Port Metro Vancouver, is a hospital for sick, injured or orphaned marine mammals. The Rescue Centre rescues stranded marine mammals and rehabilitates them for release back into their natural habitat. Donate to the Rescue Centre at www.vanaqua.org/mmr.